Britain's Andy Murray defeated Juan Monaco 2-6 6-3 6-0 at the Shenzhen Open to reach his first final since winning Wimbledon last year. The Scot, 27, levelled after a poor first set before racing through the decider against the Argentine. He will face Tommy Robredo in Sunday's final in China after the Spaniard earlier beat Santiago Giraldo 6-1 6-4. "Tommy will be a very tough opponent. I will need to play a really good match if I want to win," said Murray. It will be their first meeting since the Briton defeated him in the third round at SW19 last year. 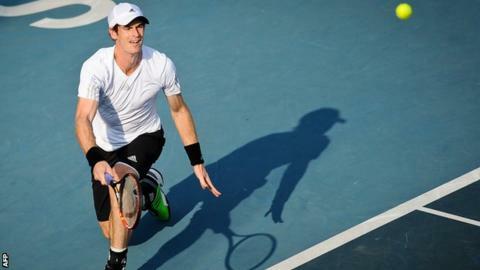 Murray's semi-final victory boosts his hopes of qualifying for the ATP World Tour Finals at the 02 Arena in November. The Briton, currently ranked 11th in the world, will rise above Grigor Dimitrov into 10th place in the race to qualify for the finals if he wins the tournament. He served 10 aces and converted six of nine break points in a performance that improved significantly as the match wore on. Murray's schedule: Shenzhen - 250 points to the winner; Beijing - 500; Shanghai - 1,000; Paris - 1,000. In hot and humid conditions, Murray fell a double-break behind at 4-1 as repeated errors, particularly off the forehand side, handed easy points to his 30-year-old opponent, who is ranked 97th in the world. A backhand that clipped the outside of the line allowed Murray to retrieve one of those breaks, but he immediately gave up his serve again, a limp forehand slapped into the net all too typical of his play. When another backhand sailed long, the Scot had lost the opening set in only half an hour. A lucky net cord and Monaco double fault allowed Murray to break first in the second set but another errant forehand conceded the advantage straight away. Andy's older brother, Jamie, and doubles partner John Peers will contest the Malaysian Open doubles final in Kuala Lumpur against Marcin Matkowski and Leander Paes on Sunday. Murray and Peers, the second seeds, beat another Briton, Dominic Inglot, and Florin Mergea of Romania 6-2 7-6 (7-0) in the semi-finals on Saturday. At 3-3 and break point down, Murray was in a precarious position but a swinging second serve allowed him to avert danger and he pounced on a poor Monaco drop shot to break for 5-3 before serving out the set. The second seed was in inspired form in the decider, winning it to love with his forehand now drawing gasps from the crowd as it repeatedly found the target and proved too powerful for Monaco to handle. "The turning point was when we were 3-3 in the second set," said Murray. "But before that he was dominating the match." Japanese world number eight and US Open runner-up Kei Nishikori made it into his second consecutive final, beating Finland's Jarkko Nieminen 6-3 4-6 6-2 in the semi-final of the Malaysian Open in Kuala Lumpur. He'll play fourth seed Julien Benneteau, of France, who knocked out the second seeded Latvian Ernests Gulbis 6-4 6-4.